Continuing our SC12 related coverage today, while AMD was the first GPU announcement of the day they are not the only one. NVIDIA is also using the venue to launch their major GPU compute product for the year: Tesla K20. 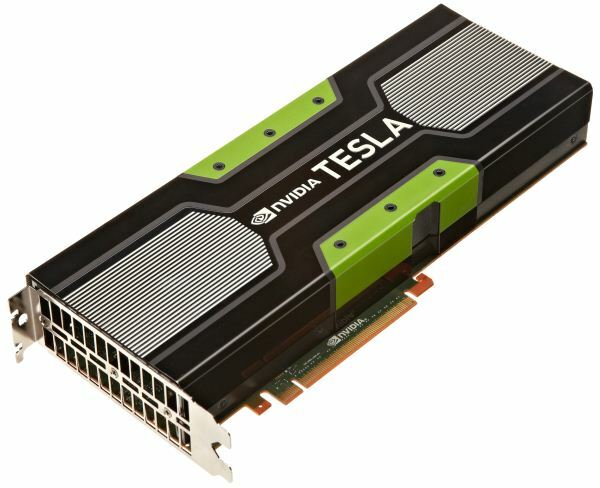 We first saw Tesla K20 at NVIDIA’s 2012 GPU Technology Conference, where NVIDIA first announced the K20 along with the already shipping K10. At the time NVIDIA was still bringing up the GPU behind K20 – GK110 – with the early announcement at GTC offering an early look at the functionality it would offer in order to prime the pump for developers. At the time we knew quite a bit about its functionality, but not its pricing, configuration, or performance. More recently, upon completion of K20 NVIDIA has dedicated most of the initial allocation to Oak Ridge National Laboratory’s Titan supercomputer, completing delivery on a contract years in the making. As it turned out K20 was quite powerful indeed, and with K20 providing some 90% of the computational throughput of the supercomputer, Titan has taken the #1 spot on the fall Top500 supercomputer list. This brings us to today. With Titan complete NVIDIA can now focus their attention and their GPU allocations towards making the Tesla K20 family available to the public at large. With SC12 and the announcement of the new Top500 list as their backdrop, today NVIDIA will be officially launching the Tesla K20 family of compute GPUs. When NVIDIA first announced K20 back in May we were given a number of details about the GK110 GPU that would power it, but because they were still in the process of bringing up the final silicon for GK110 we knew little about the shipping configuration for K20. What we could say for sure is that GK110 was being built with 15 SMXes, 6 memory controllers, 1.5MB of L2 cache, and that it would offer double precision (FP64) performance that was 1/3rd its single precision (FP32 rate). Now with the launch of the K20 we finally have details on what the shipping configurations will be for K20. First and foremost, K20 will not be a single GPU but rather it will be a family of GPUs. NVIDIA has split up what was previously announced as a single GPU into two GPUs: K20 and K20X. K20X is the more powerful of these GPUs, featuring 14 active SMXes along with all 6 memory controllers and 1.5MB of L2 cache, attached to 6GB of GDDR5. It will be clocked at 732MHz for the core clock and 5.2GHz for the memory clock. This sets a very high bar for theoretical performance, with FP32 performance at 3.95 TFLOPS, FP64 performance at 1.31 TFLOPS, and fed by some 250GB/sec of memory bandwidth. For those of you who have kept an eye on Titan, these are the same specs as the GPUs Titan, and though NVIDIA would not name it at the time we can now confirm that Titan is in fact composed of K20X GPUs and not K20. Below K20X will be the regular K20. K20 gives up 1 SMX and 1 memory controller, giving it 13 SMXes, 5 memory controllers, 1.25MB of L2 cache, and 5GB of GDDR5. It will also be clocked slightly lower than K20X, with a shipping core clock of 706MHz while the memory clock is held at 5.2GHz. This will give K20 theoretical performance numbers around 3.52 TFLOPS for FP32, 1.17 TFLOPS for FP64, fed by 208GB/sec of memory bandwidth. This split ends up being very similar to what NVIDIA eventually did with the Fermi generation of Tesla products such as the M2090 and M2075, spacing their products not only by performance and pricing, but also by power consumption. K20X will be NVIDIA’s leading Tesla K20 product, offering the best performance at the highest power consumption (235W). K20 meanwhile will be cheaper, a bit slower, and perhaps most importantly lower power at 225W. On that note, despite the fact that the difference is all of 10W, 225W is a very important cutoff in the HPC space – many servers and chasses are designed around that being their maximum TDP for PCIe cards – so it was important for NVIDIA to offer as fast a card as possible at this TDP, alongside the more powerful but more power hungry K20X. This tiered approach also enables the usual binning tricks, allowing NVIDIA to do something with chips that won’t hit the mark for K20X. Moving on, at the moment NVIDIA is showing off the passively cooled K20 family design, confirming in the process that both K20 and K20X can be passively cooled as is the standard for servers. NVIDIA’s initial wave of focus for the Telsa K20 is going to be on servers (it is SC12 after all), but with K20 also being an integral part of NVIDIA’s next-generation Maximus strategy we’re sure to see actively cooled workstation models soon enough. Thank you insane amd fanboys, for months on end, you've been screaming that nVidia yields are horrible and they're late to the party, while nVidia itself has said yields are great, especially in the GPU gaming card space. now the big amd fanboy lie is exposed.
" Interestingly NVIDIA tells us that their yields are terrific – a statement backed up in their latest financial statement – so the problem NVIDIA is facing appears to be demand and allocation rather than manufacturing." I'm so glad this site is so fair, and as we see, as usual, what nVidia has been telling them is considered a lie for a very, very long time, until the proof that it was and is actually the exact truth and has been all along is slammed hard into the obstinate amd fan brain. So nVidia NEVER had an ongoing yield issue on 600 series..
That's what they said all along, and the liars, knows as amd fanboys, just lied instead, even after they were informed over and over again that nVidia did not buy up a bunch of manufacturing time early. Thanks amd fanboys, months and months of your idiot lies makes supporting amd that much harder, and now they are truly dying. Thank you for destroying competition. Anand, I am a Nvidia fanboi. But still i was surprised by your AMD S10000 coverage. That merited a page in the _pipeline_ section. And a product from Nvidia gets a front seat, _3 page_ article ? It was promised, but it never was published.